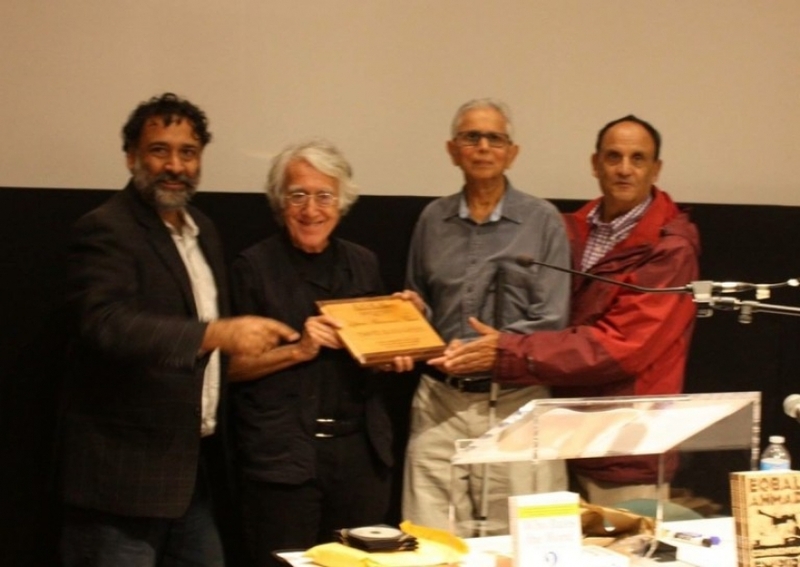 On September 10, Vancouver-based Radical Desi monthly magazine honored Armenian-US author, radio journalist and human rights activist David Barsamian, 72, with Life Time Achievement Award for his tireless support for oppressed native people such as Palestinian, Kashmiris, and Hindu Dalit. Narendra Modi government recently denied visa for David Barsamian to visit India over his writings supporting Kashmiri people living under Indian occupation since 1948 and 200 million untouchable low-caste Hindus (Dalit). He was deported from New Delhi airport on September 23, 2011. Even his recent appeal to Indian foreign affairs’ minister Shushma Swaraj didn’t work out. Earlier, Barsamian had visited India regularly for three decades. He speaks Hindi and Urdu fluently and is a good sitar player which he learned from his Hindu guru in India. Barsamian is a great admirer of Palestinian-American academic and author Dr. Edward Said (died 2003). Barsamian has co-authored books with Edward Said, Tariq Ali, Arundhati Roy, Eqbal Ahmad, Howard Zinn, Richard Wolf and Noam Chomsky. Barsamian says Palestinians are fool to expect Washington to be an honest broker in Israel-Palestinian conflict – as the US will do what Israel wants. “This has historical been big mistake. The PLO always thinks Americans are going to deliver for them and provide some kind of deal. The American will only do what is in the best interest of Israel. They don’t give a damn about Palestinians. They’re a nuisance for Washington. It’s Israel and oil that they’re concerned about. Arabs and Palestinians are so colonized by the US that they believe that patron of their oppressor is going to be their liberator. This kind of thinking has mad PLO lazy and ineffective. They may believe in the tooth fairy,” he said in an interview with Armenian-Lebanese Aztag Daily on February 12, 2004. “In Kashmir, the scale of human rights violations from collective punishment and assassinations to custodial deaths and disappearances is staggering. Yet little of what goes on in that Himalayan region reaches the outside. Why? India controls the cameras, microphones and print media and it has been skillful in framing Kashmir in the 9/11 terrorism discourse. Those who resist Indian rule, Delhi tells the world, are fundamentalist jihadis backed by Pakistan. Kashmir is an unresolved issue dating back to the disastrous 1947 British partition plan to divide the sub-continent in two: a Hindu majority India and a Muslim majority Pakistan. Today, Kashmir is one of the most dangerous places on earth. Both India and Pakistan have huge militaries and nuclear weapons. And the Kashmiris are stuck in the middle,” says Barsamian. Barsamian has visited Israel but his criticism of the Zionist regime was never forgiven by the organized Jewry. In June 2011, his scheduled appearance along with British journalist, author and filmmaker John Pilger at Lannan Foundation in Santa Fe was banned and canceled by its Jew owner Patrick Lannan. Watch below Barsamian’s interview with Arundhati Roy on American and Indian imperialism.